So how is your decorating going? So far, in addition to my paperwhites, I have hung a wreath and put up the garland around the front door. Unfortunately, I failed to test the lights before I hung the garland, and when I plugged it in, only half the lights were working. Aaaarrrgh! I also put a small tree on the back porch. More to come soon. I did a dry run of something different on the mantel, and snapped the picture above, but then I realized that this was just a non-starter because my kids have traditions to uphold. So the decorating is progressing at a stately (or is that glacial?) pace here, but that's OK. It'll get done. I'll be back later for another peek to see your exquisite decorating! I understand your frustration with the lights. This year, I bought new commercial grade lights. No problem. . .wrong, a bulb was missing and only half of one stand worked. The tree is completed now and I enjoy my coffee in the morning with it's presence as the only glow in the room! Thank you for the reminder of Traditions! I like the mantel as it is. I'm going slowly too. In fact, I haven't even begun. I am hoping to join you tomorrow! It certainly is a busy time. 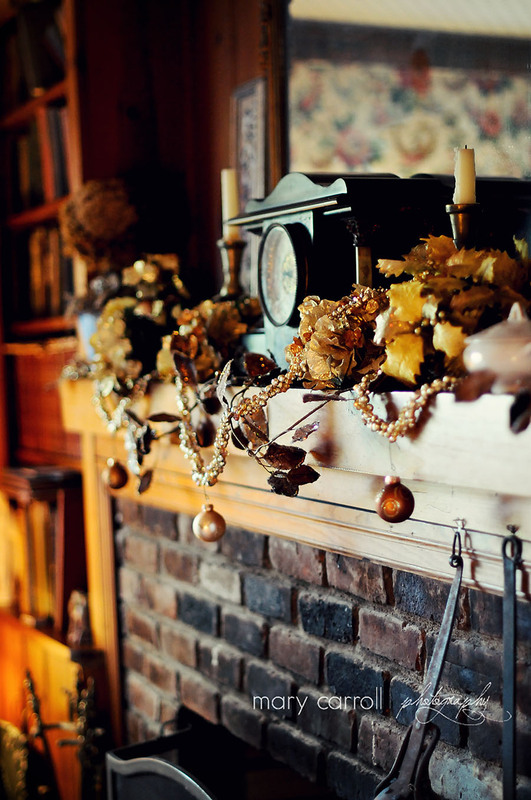 Love the muted golds on your mantel. Funny thing with the children...they definitely do have their standards and traditions. I'm still trying to keep mine happy and they're both in their 30s now. But, if I ever went into my mother's home and didn't see the garland of vintage lights wrapped around her kitchen window, I'd be unsettled, too. Yup lights are always a challenge, I did test mine but after I got them on the tree only one and a half strands worked...I gave up on trying to find the loose bulb for right now...at least most of our tree is lite lol. I love this mantle...the pic looks like it should be in a magazine...I sympathize with the kids and traditions thing...this yr I am creating new ones (see yesterdays post) to protect my breakables from the toddler. There's a cedar wreath on the front door and a flag pole hung with lights to look like a giant tree at night - but nothing else! My daughter brought down the rubbermaid boxes yesterday, and they sit in the living room, waiting. Tomorrow I'll be back on the road for a week, so if I don't do something today the boxes may sit there all week. I've never been so late! I'm done with the decorating and I'm glad to have a weekend where I don't have to do it! Your mantel looks so pretty...love that! Hi Mary ~ Your mantle looks really stylish. The only decorating going on here is the wrong kind this time of year. Hubby is removing the bathroom. Maybe next week I can bring the Christmas box's down from the loft and have a look through not sure what look to have this year. It tends to go in increments here too, Mary. Every year I think I'll do better. Every year it doesn't happen. LOL! I sure hope to participate in MM! Maty, I understand about the traditions with your kids. My son is 29 and still comes home to help decorate the Christmas tree with all the old ornaments I've collected since he and his sister were born. I see all these women who buy new ornaments and have a completely new style every year. Not at this house. We have the old ornaments made in Sunday school and elementary hanging on our tree every year. I have to say I love my tree and wouldn't trade it for all the new ornaments in the world !!! Oh dear, I meant to say Mary! The decorating is going slow, you, however look like your are progressing nicely. Can't wait to check back later to see what you've done! Some day you will be able to do whatever you like on that mantle....smiles. Mine is at a huge standstill or at least I feel like it is. I just moved here over the summer and this is the first year I have tried to decorate the new place. I still have a lot of things still in storage (including furniture)so I am struggling. Oh Mary, can I ever relate to the 1/2 string not working. Ugh, it is so frustrating. I just put a pre lit tree up and the lower 1/2 of lights quit working. Christmas lights are so frustrating! Today is my day to do ALL my decorating except for the tree...we use a live tree and I don't like to put it up this early. I have checked the lights tho and sure enough half of them aren't working...if I give them a shake they work! Frustrating! I'm right with you, sister! Decided yesterday was THE DAY to get the tree decorated (we'd bought it a week ago and it's been sitting on the back porch waiting). Got the lights on and the last strand went out. Sent hubby to pick up another strand while he was out grocery shopping, so I tried decorating around the missing light strand, while still trying to keep the decorations balanced, an impossible task. So, the tree's only half done and haven't thought about the mantel yet. (Love your mantel, BTW.) The grown kids do have their expectations, but I'm still the hardest to please. Right now I'll be happy when all the boxes and bags are back in the attic and I get my living room back. I haven't even gotten a wreath yet (I always use fresh). The decorating seems more daunting every year though I tend to do less -- why is that? And then there's all the shopping... It is certainly stress-inducing, but I wouldn't think about NOT doing it all. There are those self-imposed expectations, after all. But it did snow yesterday (a treat for us down south) and it helped set the holiday mood. Your mantel looks pretty, Mary, but I do understand about traditions, too. Love your mantel colors, Mary! Decorating is finally making some progress here this weekend, but there's more to do. Not sure how much I'm going to tackle. If the lights on one more PRE-LIT tree decide to stop working after only a couple of years, I may just quit! How long are they supposed to last anyway? Surely more than only 2 years!